X Bat is the manufacturer of the finest maple and ash wood pro quality baseball bats made anywhere today. X Bat is very involved in the development of baseball players of all ages from T-ball to the Major Leagues. We feel that using a wood bat is the best developmental tool for hitting that a player can use. We have personal experience with some of the top high school, collegiate and professional players and strongly believe that the X Bat maple bat is the best made, most durable and most consistent wood bat available today. We are actively involved in the ongoing improvement of X Bat and take the greatest pride in spreading the word about the X Bat - the finest wood bat made. 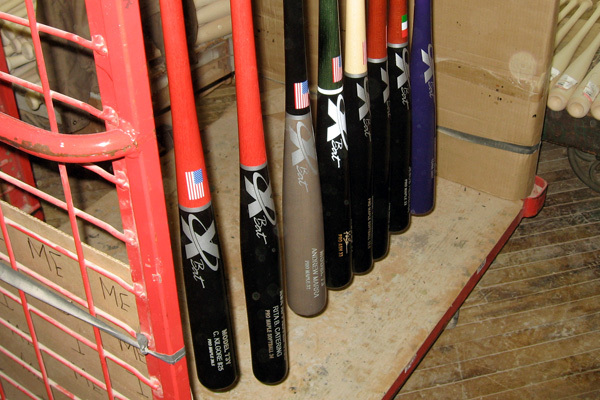 All X Bat are made in the United States from the highest quality hard maple wood. It seems more and more young baseball players are training with wood bats. There is nothing like the sound of good solid contact between horsehide and wood. Unlike aluminum bats, a wood bat gives a hitter immediate feedback as to the quality of his contact. For the past few years, the X Bat has been the choice of players seeking with a stronger, longer lasting wood bat. The problem is the short supply of top quality wood to make the bats. The best wood goes to the professional teams and the next best grain goes to the AAA ballplayers and the quality dwindles by the time you get to Rookie ball. The player who buys his typical ash bats from a sporting goods store is getting the leftovers that didn't make the grade for the pros. The traditional ash bat that is sold for $40. or more all too quickly becomes an expensive piece of firewood when it cracks or splinters after a few days of hitting. A few years ago a couple of baseball enthusiasts tried to improve upon the traditional white northern ash bats that have been a mainstay in baseball circles for decades. It was soon discovered that hard maple or sugar maple (the same trees which supply the sap where that delicious Maple Syrup comes from) makes a stronger more resilient wood bat. Using a harder more dense wood results in a bat that hits the ball farther and lasts longer than other wood bats. The supply of this select hard maple is short and it takes more effort to craft a quality bat, but as those who have seen and hit with an X Bat can attest, the result is a bat which exceeds the standards of the even the most discriminating major leaguer. Due to the short supply of major league quality maple and ash and the expense and time it takes to produce a wood bat of the highest grade, it is no wonder that these bats have never before been available to the general public. X Bat is the only company that will make you a bat with the exact same quality wood as we make for our 200+ Major League players. X Bat Pro maple and ash wood stock is drawn from the timber grown in the vast northern hardwood forests ranging from Pennsylvania to New England to Quebec. Beginning with the loggers who select the optimum growth, the saw log goes to the newest, most technologically advanced and efficient sawmills. Grade recovery and optimum utilization are both important. Although the maple is 100% clear of defects with no cross grain, Tuff Bats insists that the square be straight grained over 24" of running length. As a consequence, only 10-15% of the total kiln run qualifies for the professional grade X Bat. Other bat companies buy maple and ash billets from mills who produce these for the furniture industry and adapt them to make bats. We choose logs most suitable to our specific application and cut and dry them for the highest grade wood baseball bats available anywhere in the world today. Once a billet has been produced, it has to be weighed. Only about 50% of each kiln run yields billets light enough to make bats. The other 50% of the billets are sold to furniture makers and other bat companies who make bats with no specific weights or with thin barrels to make he desired weight. Each specific model in each length and with a specified desired end weight uses a billet in a specific weight range to yield a finished bat that is 34 inches and 31.5 ounces. Thousands of billets must be weighed, sorted and hand picked to make each individual bat. There are NO other bat companies that go through this labor intensive, time consuming and costly process to make a bat for you. After the lathe run, bats with surface blemishes are immediately removed and discarded so the finished product is as beautiful as it is functional. The hardened furniture like finish immediately distinguishes X Bat from EVERY other bat on the market today so that you, the player, will have the best bat possible. Our premium Pro Stock is used in ALL X Bat so that every player ordering their bats from us will have the same wood as the Major Leaguers. X Bat are made from select hard maple or sugar maple which, because of its closed grain structure, provides excellent resiliency and greater resistance to denting, fracturing and splintering. The wood is more dense (and heavier) than the northern white ash used in most traditional baseball bats. The result is wood baseball bats are less apt to break and exhibit more "pop" than ash bats. There is no need to tape the barrel as you would when practicing with ash bats as the maple will not split and separate. Another bonus is when the handle is dampened, the maple grain will raise, providing a better grip on the bat. The X Bat is made in the United States . All X Bat are custom built for each individual's preferences as to length, weight, barrel size, handle, knob, colors and finish. Only a few dozen X Bat are made each day due to the level of craftsmanship necessary to fabricate a quality bat from maple. All existing bat models can bemade and X Bat has developed their own model bats as well. Models are made to adhere to acceptable weight/length differentials, usually ranging from -3 to +8. When you order a 33.5" Model 24 with a weight of 31 oz., you will get a bat as close to the prototype as humanly possible in weight. X Bat can be personalized with your name, team name or logo and in a wide range of colors and combinations. Traditional colors are available: black, dark walnut, mahogany, cherry, golden oak, chestnut, natural and unfinished; plus custom colors: yellow, blue, purple, orange, red, green, teal, silver, gold, charcoal, and cordovan. The bat can be ordered with matching barrels and handles or with unfinished handles for a slightly better grip. The choice is yours. Three clear coat finishes are applied to all bats to enhance the maple's hard finish. Fungos are available in 34", 35" and 36" for outfield with weights from 24 oz. to 27 oz. Training bats are available for bunting control, hitting drills and infield drills. Requests for specific bat modeling are welcome. We have put the help and instructions for these templates on the 'net, so they will always be there if you want to refer back to them, and we can also update them regularly based on customer feedback. X Bats have earned the reputation for being the strongest, longest and most desired bats in baseball. The strong demand for X Bats has led to some unscrupulous people counterfeiting X Bats and selling them to the public. If you have any questions about the authenticity of your X Bat or to see if the dealer you purchased from is an official authorized X Bat dealer, please do not hesitate to ask us.